Thanks to Bardicblogger for nominating Inkspeare for the Illuminating Blogger Award – I am honored. I have copied the rules for accepting this award from his blog and I am sharing them here. So about me, I love vintage tools. I enjoy many blogs, but here are five that I visit frequently and love. And of course there are so many more that I love to read. ← Why Can’t I Have my Cake and Eat it Too? I’m really honored to have made your list of five. Thank you. And you SO rightly earned the award from Bardicblogger. I love the unrefined vegan, too … Great choices and congrats on your award! 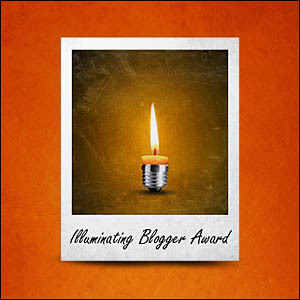 Thank you Inkspeare for nominating Jittery Goat for the Illuminating Blogger Award – I am honored and a bit overwhelmed. Now I have to live up to expectations; something I don’t do so well. I have been nominated for similar awards and declined. I’m caving in this time. I know nothing about this award, but like every other award I’ve ever received it will probably require a credit card and I’ll have to listen to a presentation at the Holiday Inn. If I have to travel some place to receive it, I’m busy that weekend. If there’s a cash prize involved I’ll be there. But seriously, anytime somebody takes time to single out your work it is a humbling thing and much appreciated.